Join Donna monthly to put together this unique paper pieced quilt. 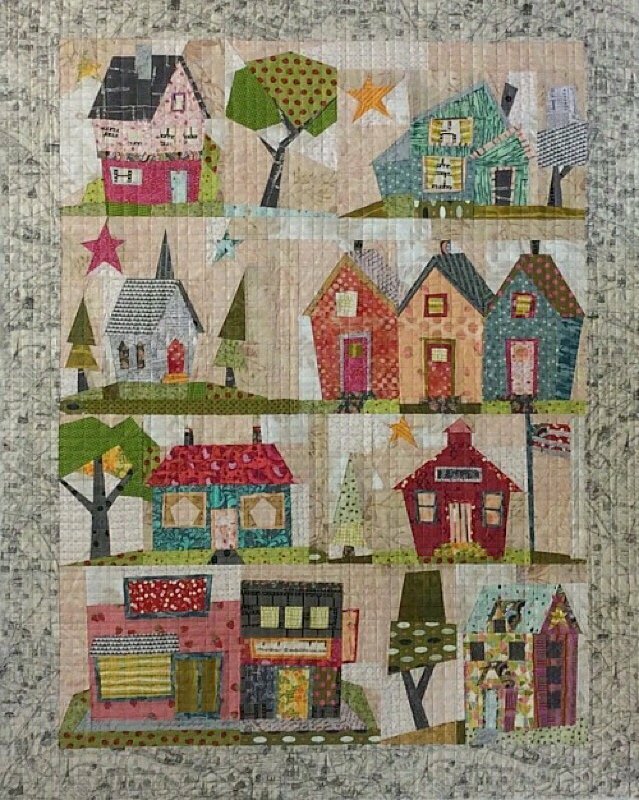 "My Kinda Town" quilt pattern designed by Peggy Larsen for Fiberworks features 8 whimsical paper pieced blocks in a quaint town setting! Pattern includes complete instructions for the quilt and full sized piecing patterns. This project is a great stash buster. There is no need to pre-cut your fabrics. Just use a variety of solds, interesting prints, and some bold colors. Each class will focus on a different block. There are 8 Block classes followed by a 9th class to help you put it all together. Join for one block or all 8! If you want to join us "mid" series after January, please go ahead and sign up and contact Donna and she will provide instruction of how to organize your pattern before you come to class. Then, if you have not done paper piecing, Donna will provide a little "personal" time so that you can start sewing right away. Sewing machine in good working order, power cord, foot controller, etc. 80/12 Mictrotex Needles or similar sharp needles (nothing smaller than 75/11 is recommended as some needle threaders might have issues with smaller needles. Pins - Flower Pins with a flat head are recommended. Rotary cutter with a new blade. 28 mm size is recommended. CLASS REGISTRATION PROCEDURES; You can register for any class in the store. If you are paying by credit card, you can register by mail or phone (760-739-8222 or 800-401-8151). The registration fee for the class must be received to reserve your space. Most classes have a minimum number of students to run. If we do not meet the minimum number of students for the class three (3) days prior to the class, we will notify you that the class is cancelled. If your class is not held for any reason, you may transfer to another class or receive a refund. You may cancel for a full refund up to four days prior to the class. No refunds can be given within three days prior to a class. Must purchase My Kinda Town Pattern for this class.